William Nixon was the son of Joseph and Jane Nixon. He was born about 1885 in Derryloran area of Cookstown. By 1901, William had left school and was working as a post boy. His mother is recorded as a widow. From about 1905, William had been employed in Adair’s Mill at Greenvale. William Nixon and Emma Davidson were married in 1909. They went on to have two children. William had been on the Reserve Army prior to the outbreak of the war. 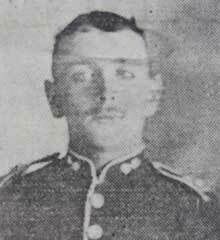 Private William Nixon was serving with the 2nd Battalion of the Royal Inniskilling Fusiliers when he was killed in action near Mons in Belgium on Wednesday 26th August 1914. Esnes is a village in the Department of the Nord, 8 kilometres south-east of Cambrai. The Cemetery is north-east of the village on the road to Langsart.